The severe topography and lack of infrastructure in Mexico causes the rural population of many regions to be rather isolated. This complicates the already challenging problem of providing consistent quality education in a country of limited resources. Many children are required to travel 5km over rough terrain, along steep, treacherous mountainous trails. After this grueling early morning hike, such children have very little energy left for learning. When it rains the passes are even more difficult to navigate, causing children to stay home. In Guanajuato, absenteeism posed sufficient problems that some schools were facing closure. Even if the means were available to buy a school bus and maintain it, it is unlikely that a vehicle would be able to negotiate the perilous mountain terrine. The mayor of “Ojo de Agua” came up with a unique, sustainable solution to the dilemma. 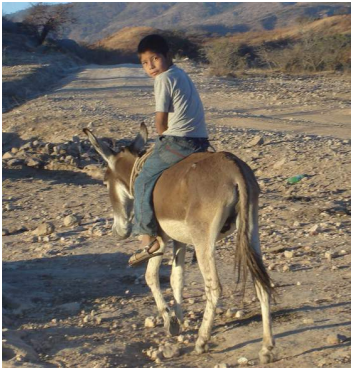 The town purchased 26 donkeys and distributed them to families in the surrounding region. The donkeys not only cut the travel time in half; they allowed the children to arrive at school sufficiently rested to apply themselves to their lessons. An additional bonus is that after school the donkeys help out on the family farm. A donkey does not need gasoline, it never breaks down and is relatively inexpensive to maintain. It was a simple solution where everybody wins.